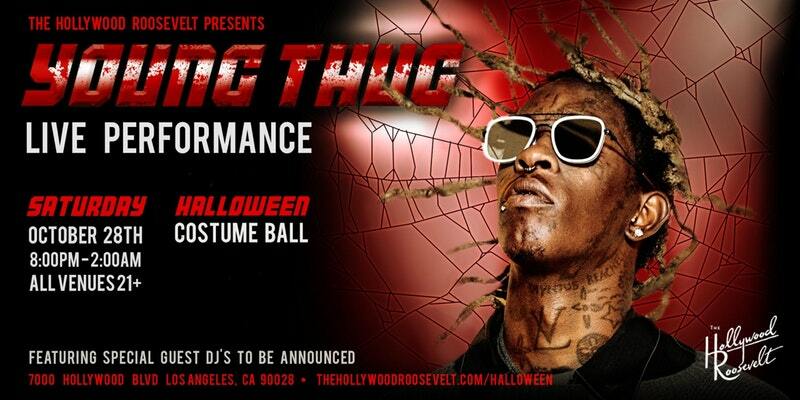 This year’s Halloween Costume Ball at The Hollywood Roosevelt is being headlined by rap god and style icon, Young Thug. Get dressed up for a wild night across multiple rooms at the storied hotel, including the iconic Tropicana Pool, Blossom Ballroom, Historic Lobby, and Public Kitchen & Bar. Thugger will perform live and a slew of special guest DJs will be announced soon! Attendees are invited to don their best costumes and enjoy the spookiest night of the year with 3000 of your closest friends. It’s all going down Saturday, October 28 from 8pm-2am. Tickets are now available, with bottle packages on offer too. Over the past 12 years, The Hollywood Roosevelt has proved to be the one of the hottest Halloween tickets in town. Previous years have featured the likes of Chromeo, Biz Marquee, Marilyn Manson, and Big Sean whose performance last year was one for the history books.